Well, the scrapbooking bug has bitten me again! I've created more layouts in the past 3 weeks than I have in the past year! WooHoo!! Maybe I'll actually get an album done one of these days. Now THAT would be something! So, I made one, but it's not going in a book - look, I framed it!! 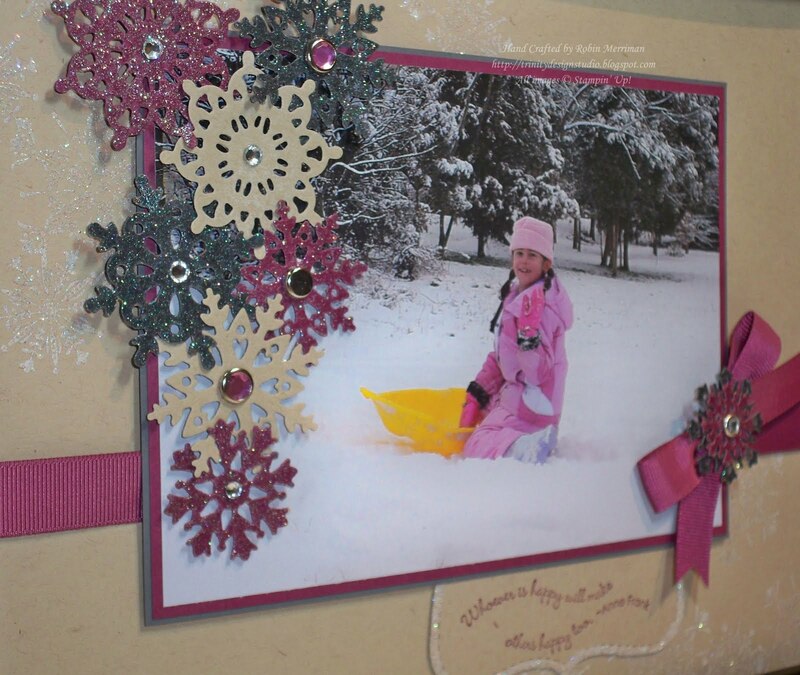 I took an 8 1/2" x 11" piece of Crumb Cake cardstock and stamped snowflakes in opposite corners using my Whisper White Craft ink and the Northern Flurries stamp set. Then I heat embossed them with Iridescent Ice embossing powder so they would sparkle. Next, I cut my photo at 5" x 7" and matted it with a piece of Rich Razzleberry cardstock cut at 5 1/8" x 7 1/8" and another cardstock piece of Basic Gray cut at 5 1/4" x 7 1/4". I wrapped the length of the Crumb Cake cardstock background with a piece of Rich Razzleberry 5/8" Grosgrain Ribbon and then mounted the photo over it with Stampin' Dimensionals. I took a piece of Rich Razzleberry and a piece of Basic Gray cardstock and covered them with Versamark ink, then heat embossed them with Iridescent Ice. 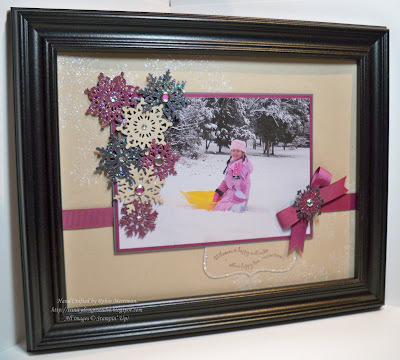 Next, I used my Big Shot and the Northern Frost die to cut out some sparkly snowflakes! And I cut a few more with some Crumb Cake cardstock - unglittered. 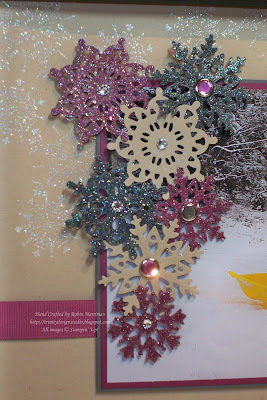 Each snowflake had a sparkly or shiny center added to it with Rhinestones, Rhinestone Brads or Silver Brads and then they each were added to the left side of the photo with Stampin' Dimensionals. I have to say that I really love how this turned out! I added a bow of Rich Razzleberry Ribbon which was jazzed up with more glittery snowflakes and a Rhinestone Brad. 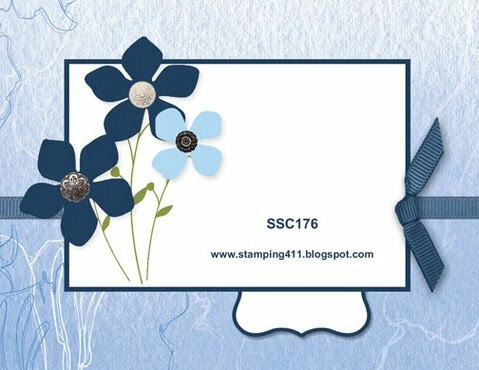 The journaling tag was done with the Top Note Die on my Big Shot with Crumb Cake cardstock. 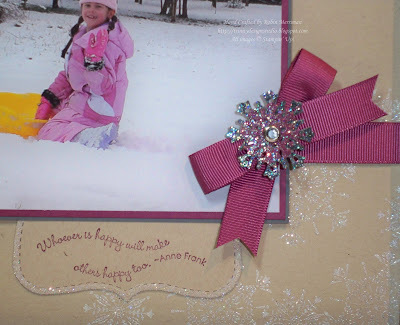 I stamped the greeting from the Hope Happens stamp set with Rich Razzleberry ink and added Dazzling Diamonds glitter to the edge with my 2 Way Glue pen. It's simply attached to the back of the photo with SNAIL adhesive. Once I finished it, I popped the glass out of a document frame that I'd picked up at the big blue box store and voila - instant wall art! Beautiful! I need to think of some new adjectives for use when visiting your blog - beautiful, amazing and awesome are getting worn out. Goodness! This is just fantastic!! I love it . . . your snowflakes are just out of this world! Way to go, Robin! Wow, I love the snowflakes -- I have that die but haven't had a chance to play with it yet. Thanks for the suggestion about using the iridescent ice on them! It is absolutely gorgeous! This is stunning. I can't believe there aren't more comments. I love comments on mine so I really try and comment on others too. I love the colors and the fact that you framed it. Beautiful! 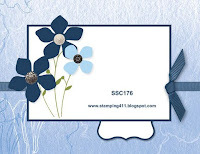 What a great idea, I haven't done any scrapbooking in a long time but I think I need to now. What a wonderful way to showcase your scrapbook page! The snowflakes are beautiful. I had to go back to the catalog to look up the die as I had rather dismissed it when I first looked through the mini. Now I see it in a different eye! What a great idea Robin! Love this and will probably use this idea. Thanks for sharing. You go girl! You are such a scrapper now! Love the colors and all that shimmer! Wow...what a wonderful pretty in pink page!! I just got the snowflakes, but haven't done this yet!! Beautiful!! This is SO beautiful and what a great idea to frame it! Great job, Robin!